Appropriately sized nest boxes in multiples shapes and forms are available at local bird stores and feed stores, and even larger pet store chains. Wild bird boxes can also be used (as long as it is the proper size for the bird species) - please scroll down the page for information about wild-bird nesting boxes. The nesting box has to comfortably accommodate the adults and their young. The entrance hole has to be of an appropriate size. Timneh African Grey Parrots, Blue Crown Conures, Cherry-headed Conures, Yellow Collared Macaws, White-Fronted Amazons, Mitred Conures, Nanday Conures, Hahn’s Macaws, Noble Macaws, Orange Wing Amazon Parrots, Mexican Redheads: Interior dimensions: 16" tall x 13" wide x 10" deep. Entrance hole: 3.5"; ¾” wood. Caiques: Interior dimensions: 16" tall x 13" wide x 10" deep. Entrance hole: 3”. ¾” wood. Kakarikis, Chattering Lory, Rainbow Lories, Red Lories: Boot-shaped box; Interior dimensions: 16" tall x 16" wide x 8” across the bottom x 8" front to back and 8" tall "toe" The inspection door is best placed on top of the "toe." The entrance hole should be about 3.5" entrance hole; ½” wood. Here are some tips on where to put bird houses: Place the bird house at a height that's convenient for you. After all, you'll want to watch what goes on and keep the box clean. It's a lot easier to clean out a box at eye level rather than high up in the air. Bird houses mounted on metal poles are less vulnerable to predators than houses nailed to tree trunks or hung from tree limbs. Provide no more than four small nest boxes for any one species or one large box per acre. Don't put bird houses near bird feeders. Don't put more than one box in a tree, unless the tree is extremely large or the boxes are for different species. During hot summers, face the entrance holes of your boxes north or east to avoid overheating the box. Purple Martins, Woodpeckers and Chickadees usually chip out tree cavities to roost in and raise young each season. 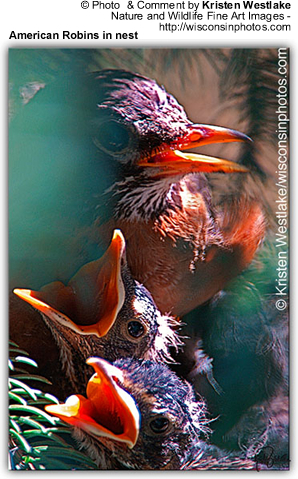 Other cavity nesters, Nuthatches, Wrens, Titmice, Flycatchers, Bluebirds, some of the Swallows, Owls and Ducks, and a few other species search for these cavities to raise their young in once they are abandoned by their original inhabitants. Build a bird house by simulating a tree cavity. Some of the bird species that nest in tree cavities will nest inside wood birdhouses if the boxes and their entrance holes conform to species specific dimensions and if the bird houses are properly mounted at appropriate heights in suitable habitats in the regions indigenous to each species. Some species that nest on tree limbs or rock ledges will nest on wood platforms. Some species are more easily attracted to boxes or platforms than other species. Some have maintained special relationships with humans for centuries. In North America, about 55 bird species will nest in bird houses and at least 15 will nest on platforms. Since most cavities are excavated in dead, dying or diseased trees with soft interiors, there is a shortage of habitat supporting cavity nesters in towns and cities where foliage are groomed and dead trees are considered unsightly. Many bird species we might expect to find only in forests or open country are found in cities. Since birds have that unique ability to fly, they appear suddenly in areas where they were previously absent. The right bird house design in the right area can attract a bird pair to nest. Some birds that do not migrate south in cold weather look for boxes to roost in. Woodpeckers normally chip out new cavities for winter and they may roost in boxes. Build wooden birdhouses with ventilation, water drainage, a means to mount securely, and access to the interior for cleaning. Investigate species intrinsic to your area and nestbox dimensions intended for those specific species. Some prefer decorative birdhouses and painted birdhouses. A few birds that nest in trees, stumps, bushes or rock ledges will nest on platforms. Robins nest on door and window mantels. Phoebes and Barn Swallows nest in open sheds. Cliff Swallows nest under bridges and building eaves. Peregrine Falcons will nest on tall building ledges. Robins are probably the most easily attracted birds to a platform. Blue Jays, Phoebes and Mourning Doves that normally nest in trees will nest on platforms. Song Sparrows, Catbirds and Brown Thrashers will nest on platforms placed in shrubbery. Carolina Wrens and House Finches nest in either boxes or platforms. Barn Swallows and Cliff Swallows occasionally take advantage of a ledge placed in the right spot. King Birds will sometimes nest on posts. Great Horned Owls, Red Tailed Hawks, and Osprey will nest on large heavy-duty platforms mounted high in the right places. When mounting a wooden bird house, in addition to placement for a specific species, consider accessibility for convenience and safety when monitoring and cleaning. Be sure houses are securely mounted. Don't crowd a yard with nestboxes. Wrens may build nests in several boxes before selecting one, but too many boxes may deter other birds. Bluebird nest boxes should be about 100 yards apart although swallow boxes can be placed within 10 yards of the bluebird boxes and make good neighbors as they are less intimidated by sparrows. Woodpeckers, Chickadees and Owls do not migrate south in winter and may use nestboxes in winter. Mounting in the fall or winter will give the box a chance to weather before spring. Place 1 or 2 inches of dry wood chips in the boxes intended for Woodpeckers, Chickadees and Owls. Sawdust will not ventilate and dehydrate as well as chips and chips are easier for birds to rearrange or pack in and out. Fill a box intended for a Flicker. They will excavate the chips. For all other birds, no nesting material or food should be placed in a bird house. Don't put bird houses near bird feeders. Face away from prevailing winds and out of prolonged direct sunlight. Hanging/swinging birdhouses are preferred by some species and rarely used by others. Wrens like them. Chickadees and Tree Swallows will use them occasionally. Monitor your bird houses being careful not to disturb during nest building, incubation or brood rearing. If you observe regularly and everything seems ok, if birds are gathering nest materials, or feeding their young and can hear the hungry young birds calling for more food, there is really no reason to open nest boxes. Make sure there isn't something in them other than intended. Nestboxes also attract squirrels, mice, snakes, insects and unwanted birds like house sparrows or starlings. Make sure desired birds aren't being driven away. If they are being intimidated by more aggressive bird species, it's a sign they are in peril. Nothing is more disgusting than finding a family of dead bluebirds, adults and babies, around a nest box. Sparrows move into homes with 1 1/2" or larger openings and starlings will use anything larger than 1 1/2". There is debate whether one species should be favored over another. We know not to interfere with natural selection, but Sparrows and Starlings are not native. Since they were introduced their populations increased to unnatural numbers displacing native species. They are agricultural pests spreading parasites and disease and they defile buildings in towns and cities throughout most of North America. They are not protected by law as are other migratory birds. Destroyed habitat, over hunting and non-native species reduced natural populations. Now, proper management is a reasonable intervention, even imperative to ensure survival of the most easily stressed species. Protect nests from raccoons, weasels, opossums, cats and dogs by mounting at appropriate heights, metal poles, and wrapping wood posts with sheet metal. Used nests are often tainted with fleas, mites, and lice waiting for more inhabitants. Feeders can spread parasites and disease. Remove nests after rearing and clean and spray nestboxes and feeders with a mix of 90% water and 10% chlorine bleach. Replace wood chips in nestboxes for ducks, woodpeckers and chickadees. Clean feeders regularly and provide more than one if large numbers feed to reduce close contact. Smaller birds will be bullied less. Make sure seed is dry and free from mold. Store seed where mice cannot contaminate it with droppings, parasites and disease. Bird Baths absolutely must be cleaned regularly. If they are not cleaned, it would be better not to have one at all.